In the middle of November we experienced some low temperatures in the mid-20s. I was surprised that the Stevia plant in the vegetable garden didn’t appear to be bothered. Even though it was covered with a sheet on colds nights just like the lettuce to protect it from frost, I was even more surprised when it actually bloomed! 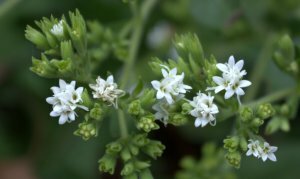 Stevia flowers in clusters of five blossoms with five petals. At this late date I thought this sweet herb plant would be toast. Didn’t even consider that it would actually bloom as it’s native to semi-tropical Paraguay. 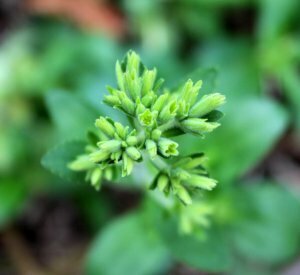 Stevia is a Zone 11 plant so I’m quite surprised that it hadn’t yet withered in the cold temperatures we were experiencing in Central Pennsylvania in Zone 5-6. Since about July the garden and grounds around here were pretty much neglected. The lawn wasn’t mowed, no weed-whacking was done, weeds grew everywhere and tomato plants weren’t lashed to their stakes like they should have been. A couple of injuries kept me on the sidelines so about all I could do was pick a few cucumbers or tomatoes for my lunchtime salads and grimace at how unkempt everything looked. 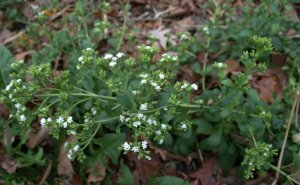 One of the plants left to fend for itself in my absence was the single Stevia plant in the garden. It fell to one side but continued growing as best it could with the side branches now reaching for the sky. Stevia side branch with many small white blooms. 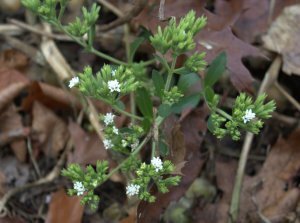 I was totally surprised to see small white flowers blooming where small flower buds were at the tips of the side branches a couple of weeks before. The whole plant probably should have been harvested then, but I wanted to see what the flowers looked like. Flower buds at the tips of side branches of the Stevia plant. Do the leaves taste just as sweet as they did a month ago? Yes! the plant was pulled out of the ground on 16th of Nov and hung upside down in the garage where it’s cool, yet doesn’t freeze. Leaves that weren’t damaged or look too dirty were cut or pinched off the plant and kept in a brown bag for storage in the pantry. We’ll brew them with some tea to lend a little sweetness naturally. I’m curious how anyone else uses this plant from the garden. Sure, you can buy Stevia products from your local grocery store, but who else uses it in leaf form? Leave a comment below so we all can learn more about this interesting plant.